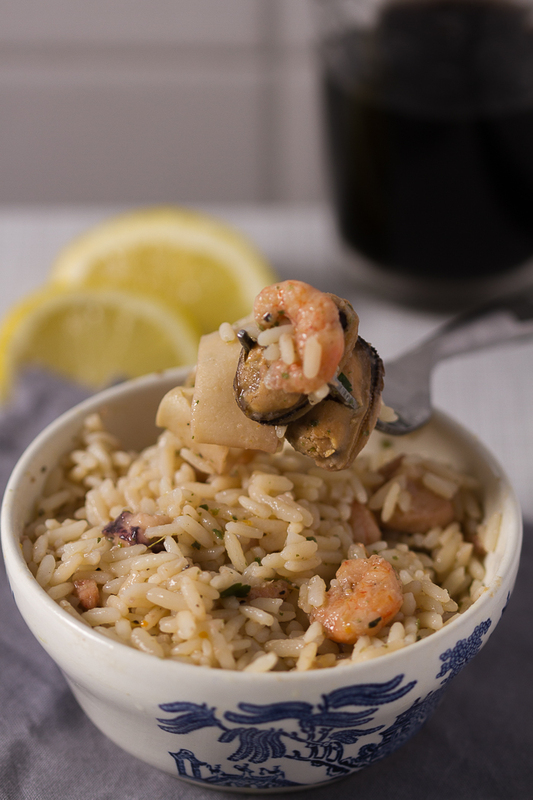 Classic seafood risotto in white wine is the quickest way to upgrade your weeknight meal into a sophisticated dinner. Minimal effort. Outstanding taste. You in? It’s been a hectic few weeks. And that’s an understatement. My phone stopped working on a Tuesday morning. After a few unsuccessful and frantic attempts to fix it on my own (and a several-hour long, futile, conversation with the service provider), I bought a ticket for DC for the Thursday of that week. I don’t know about you, but I’m not very good about transferring files from the phone to the computer. I’m even worse at backing them up on a cloud. As a result, I lost an incredible amount of photos, files, client contacts and history… In short, a disaster I created myself. The computer situation was also growing troublesome. For a while now letters “R” and “D” weren’t working. I got a wireless keyboard thinking I’d wait until April when I originally planned to go Stateside this year. However, the comp must have anticipated this, so it started making strange noises. It got to the point where Aleksandra and I had to take frequent breaks in the middle of editing videos. Other tasks that took an hour or two, were now taking a few hours. This started to seriously interfere with my work. I took the comp to an affiliate Mac store (there are no actual Apple stores in Sarajevo), and they offered to send it out of the country to fix it. I didn’t feel comfortable with this. I had to make a decision, fast. Besides, I had to finish up additional business in the US so it made sense to take the trip then instead of when originally planned. So there I was, on the plane, one snowy Thursday morning. Zagreb, Amsterdam, DC. I arrived to DC smack in the middle of the nastiest Friday rush-hours only my fellow DCists can relate to. The traffic swiftly validated my move to Europe. After 3 hours in a rental with no GPS and no working phone, going via map directions, I finally pulled into a familiar neighborhood and jumped into an Exon station. There, the nicest clerk in the world let me use the store phone. I called the cousin I was to stay with and asked her to pick me up. Did I tell her where? Sort of. Did I tell her what car I was renting? Forgot that too. But they still made it. In about 30 minutes the entire family came to pick me up, Balkan style. A glorious welcome! And that was just the beginning of the trip. 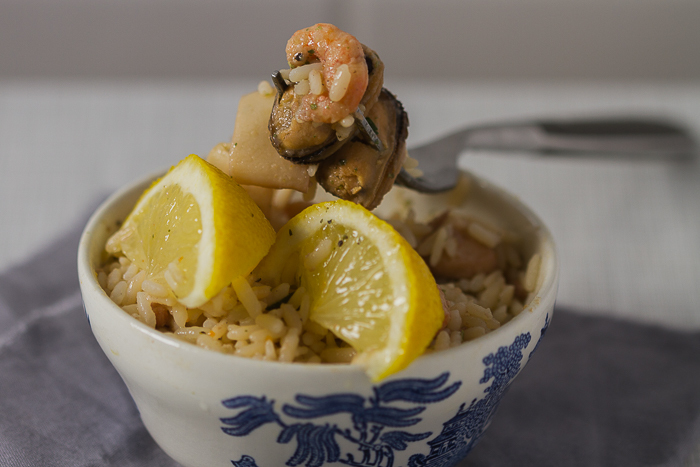 I’ll tell you more about it, but first let’s talk about this seafood risotto. Upon my return to Sarajevo ten days later, I couldn’t sleep for days. I did what most people in my situation would do and went to mom’s. Aleksandra was starting a new job so she needed a few BLB-free days. Mom and I tried out a few recipes. 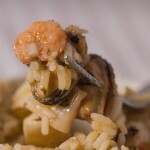 One that stayed with me is this classic seafood risotto. 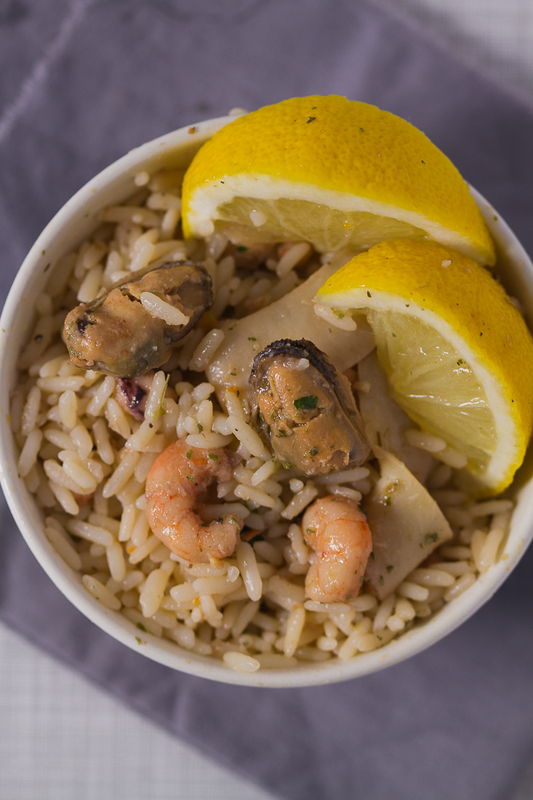 Seafood is first simmered over garlic on olive oil, then continued simmering with the addition of crisp rice which slowly softens in white wine. Aroma of this dish will stay in your home for a while. What about the taste? Sophisticated, grown up. It feels like a restaurant meal. 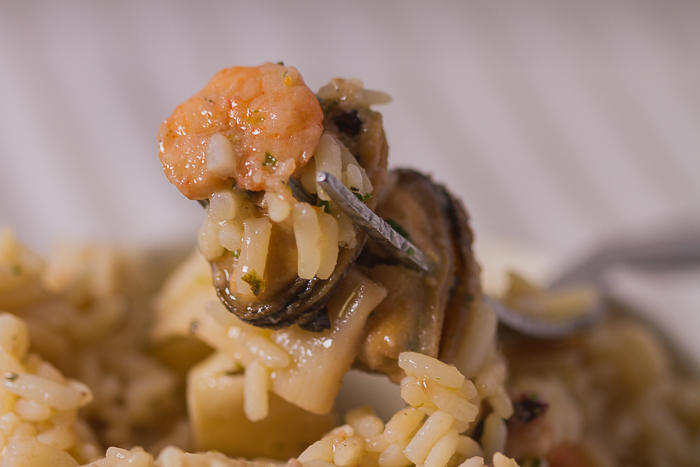 We don’t do much seafood around here, but when we do it’s excellent! I really like the recipe for the classic seafood potato salad (with eggs and onions) that goes great with any type of fish, including most seafood. Creamy saffron shrimp is also one of my favorite shrimp go-to’s, although anything shrimp warms my heart. This one is a simple 10-minute lemon and heavy-cream infused sauce with thick and filling tagliatelle. For tuna lovers there is a great little tuna salad loaded with veggies. Appetizer-wise there are the fried calamari, and who can resist them? And if you’re here only for the wine, well we’ve got the mushroom risotto in white wine for you. Who loves you? In a medium bowl, cover rice with water and leave for 10 minutes. Wash out thoroughly and strain. Heat olive oil in a large pan over medium temperature. Add garlic and simmer until golden (1-2 minutes). 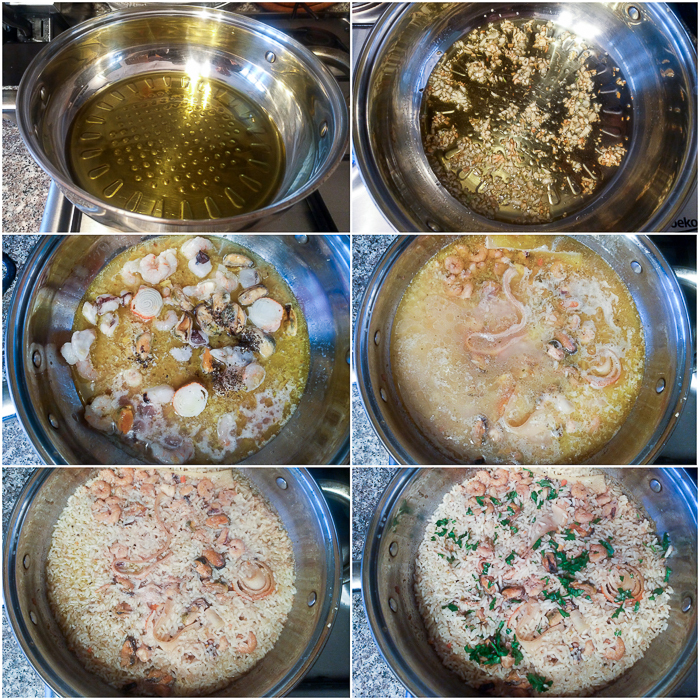 Add seafood mix, and bring to low. Let thaw and stir continuously for 10 minutes. Add spices and wine and bring temperature up to medium. Simmer and stir occasionally for 10 minutes. Add rice and one cup lukewarm water. Cover the pan halfway and simmer another 20-25 minutes (or until rice absorbs the liquid, but is not overly soft). This sounds delish but I’m afraid the seafood will be overcooked if I follow these directions. Will give it a try. Thanks for the inspiration! Simmer it for a shorter period of time and let us know how it turned out! We always encourage readers to put their spin on the recipes.